Screw worms - Protect Deer! 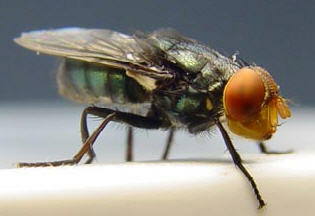 Why is everyone freaking out over a 'house fly' in South Florida? As of Mid-October, there were 83 known cases of Key Deer that had been euthanized because of the infestation of a flesh-eating fly known as the New World Screwworm that have made their way to the refuge in Big Pine, FL. What appears to look like a house fly is threatening the area causing gory injuries in deer and livestock across the U.S., South America and the Caribbean. Affected bucks, walking around with open wounds in the head and neck, find that their wounds only worsen over time...but why? It's found that the worm feasts on the exposed tissue of living warm-blooded animals. So far, Florida livestock and pets have tested positively for screwworms, but not humans. Human infections can occur, but are rare. Pets should be taken to the vet immediately to remove the maggots, if infected. Mother screwworm flies lay eggs in the wounds so the larvae can feed off the tissue as they mature into adulthood. Aside from open wounds, screwworms can invade mucus-covered tissue in the ears, eyes and nostrils. They will usually only fly a couple of miles to find a host, but can certainly travel longer, if desired. “It’s not something we ever expected,” said refuge biologist Adam Emerick, who first noticed bucks turning up with grisly wounds in mid September and, after wondering whether something might be amiss, collected four samples to test for parasites. If the flies continue North, the consequences could be dire. So, what is being done to stop the spread? Entomologists have begun releasing sterile screwworms to mate with wild flies. They plan to release about 2.7 million each week produced at a Panamanian lab jointly run with the USDA. The U.S. Department of Agriculture Command Center in Marathon is planning to eradicate the Screwworm; and The National Deer Key Refuge is considering deer fencing the perimeter to help the toy-sized deer, and to ensure they do not wander to the mainland. 1) Keep pets in-doors, especially if you live in South Florida until the outbreak is under control. 2) Fence gardens to ward of deer from your lawn and backyard garden. 3) Contact the National Deer Key Refuge for volunteer opportunities to alleviate the situation. Read the full press release from the USDA by clicking here.